$500 survey winner, LITE Feed details and you mean I’m supposed to finish what I started? The winner of the $500 Visa gift card was Melinda M. (MelMazzocco@). We’ve been in contact with Melinda and will be shipping her gift card out in the next week. Thanks to everyone who participated. A number of you commented and said you didn’t know there was a LITE Feed for MoneySavingMom. Well, it’s a new feature and I’ve not actually really mentioned it. If you come here mostly to read the content posts and aren’t too interested in the deals, then the LITE Feed is likely for you. It contains all non-deal posts — usually 1-3 per day. You can subscribe via email or RSS reader here. ::You Mean I’m Supposed to Finish What I Start?? From here on out, I’m also not going to start posting a series until I actually have it finished first. That way, I can put the posts up in a timely manner instead of letting them constantly get shelved and forgotten. And you’ll know when to expect the posts, instead of wondering if I’m ever going to post another part of the series or if I completely forgot about it! Chocolate Butterhorns… does life get much better? Oh me, oh my! My mouth is watering over here. 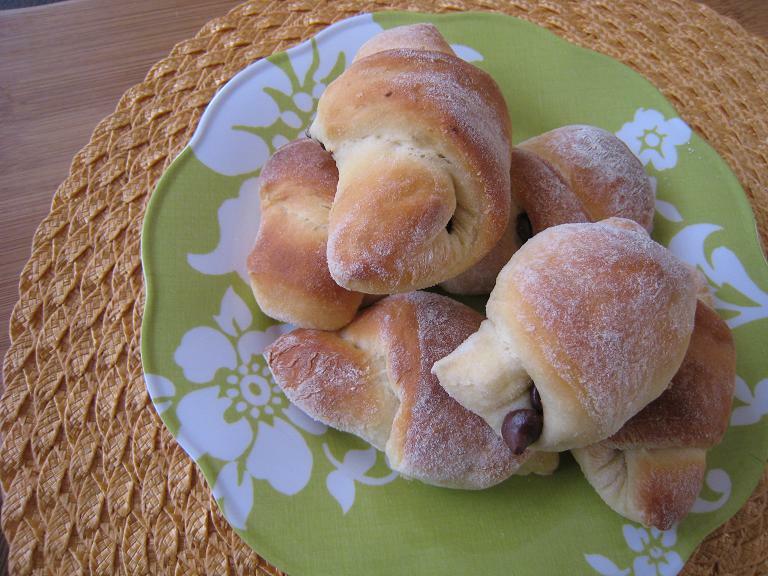 Did you see the Chocolate Butterhorn recipe that FishMama concocted from my original Butterhorn recipe? She made a good thing so much better because she cut the prep and effort down and she added chocolate. Now the question is: do I have the self-control to make them and only eat a few? Because I’m afraid I just could eat the whole entire batch of them all by myself. Nevermind all those pregnancy pounds I just finished losing! After last Freezer Cooking Day and all your rave reviews of how a food processor has changed your life, I started considering whether maybe this was a tool I should invest in. I spend a lot of time grating cheese and the processor could shave off at least 30 minutes of time each Freezer Cooking Day. I figured I’d recoup the investment pretty quickly just in that time savings alone. Plus, I could use it for chopping veggies and onions. And, based upon what you all said, I could also use it for a myriad of other tasks. After some thought, I decided to take the plunge. 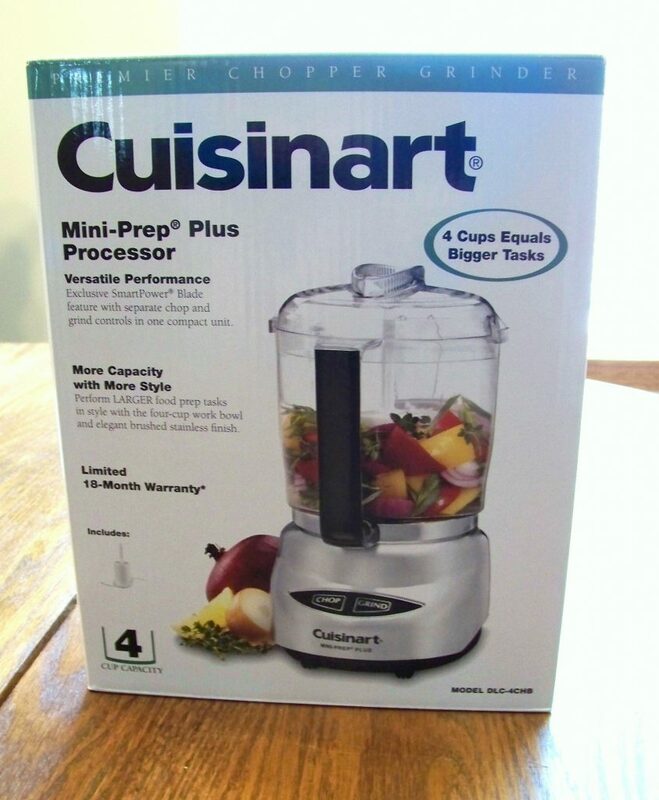 I looked online, compared prices, looked at reviews and finally decided to go with the Cuisinart pictured above. I was looking forward to the time and effort it was going to save me and I was especially happy that it was going to arrive before my next Freezer Cooking Day. Um, good question. I don’t know. But it’s a food processor. Don’t all food processors grate cheese? Well, apparently not all food processors grate cheese and the one I purchased certainly doesn’t. It grinds and chops, but doesn’t have a grating attachment. Needless to say, I felt like a complete doofus for buying something which doesn’t even do what I was specifically buying it for. And I felt even dumber that I didn’t even check the description to make sure the food processor actually grated cheese. That was, after all, kind of the whole idea behind buying it! I’m planning to return the food processor–unless someone can tell me how I can grate cheese with it (it didn’t appear there was any sort of extra attachment you could buy, but let me know if there is!). 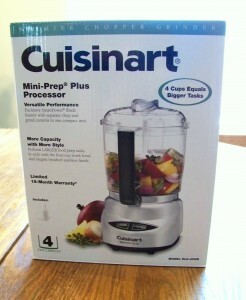 And since I’m obviously not very capable of ordering the right kind of food processor on my own, could you help me out? What brand and model do you recommend? Anything else I need to know before I royally screw up another purchase?! It’s not that I didn’t care, I was just beginning to realize the magnitude of time and effort house-hunting involves. My life is already quite full as it is, how was I supposed to carve out a number of extra hours each week for poring over online house listings and Google maps, driving around looking at homes, discussing the pros and cons of potential homes with my husband, scheduling viewings (and babysitters for those viewings! ), and then actually going and walking through different homes? It felt like I was practically taking on another full-time job! 1) Location — We picked three locations we’re interested in. If a home is not in one of those three areas, we’re not even looking at it at this point. 3) Pictures — A picture speaks a thousand words–especially when it comes to a potential home to buy. If the online pictures don’t “wow” us, we don’t pursue the house. I mean, if it looks ugly and ill-suited for our family online, I can’t imagine that it’s going to look ten times better in person. If a house meets the above criteria and is in our price-range, than we’ll look at it. Otherwise, we pass it up. By following this method, we’re looking at fewer homes, for sure. But we’re saving a lot of time since we’re only looking at homes which are really good possibilities. Just for fun: If you were to choose three non-negotiables you must have in a home you’d buy, what would they be? I’d love to hear! If you wonder why there are constantly toys all over your home, it just might be because you’ve never created a home for the toys. If you and your children don’t know where the toys are supposed to be put away in the first place, it’s hard to put them away. So not only does it help to pare down the number of toys you have, but it also is very helpful to designate places for the toys you own. At our house, toys stay in the girls’ room and the basement. If toys are brought into the living room or kitchen, we encourage the girls to promptly return them to their places once they are finished being played with. We have a few shelves in the basement for books and toy tubs and then a section of their closet to put dolls and doll things. We store arts and crafts along with the rotating toy bins (see more on this below) in the school room closet. Need help getting started designating a place for your toys? 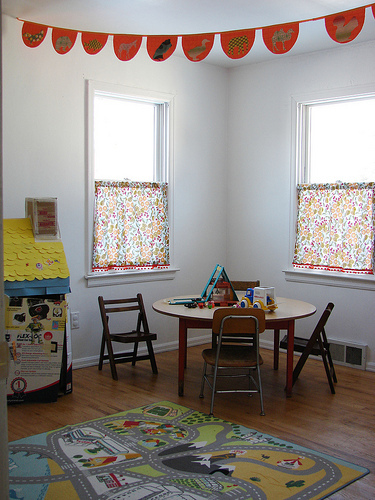 Check out Five Steps for a Pared Down Playroom. If you have more than one child, it might be helpful to have assigned areas for each individual child’s toys and then a place for toys that everyone shares. You might consider having a tub or shelf labeled with each child’s name. Perhaps this could also be a way to deal with toy overload as well: when the shelf or tub is full, you can’t get any new toys until you get rid of some that you already have. See how Kate implemented this in her home. Train your children from an early age to pick up their own toys and messes. It takes work, effort and consistency to teach children to be assets to the home rather than liabilities, but it does pay off. Training is practicing doing something again and again and again in order to get it right. Don’t expect your children to be able to pick up all the toys and put them away perfectly the first time you ask them to. It’s going to take showing them what’s expected, helping them do it correctly, gentle encouragement and lots of practice. But, with time and practice (and patience! ), your children can learn to pick up after themselves. Observe your own actions over the course of a week: are you often leaving things out instead of putting them away in their designated places? Do you pick up what you got out? If not, I encourage you to start working on the person you see in the mirror first. You can’t expect your children to pick up after themselves if you’re not setting an example of doing the same. If you feel like you have too many toys, but you don’t want to part with what you have, consider a rotational toy system. Put away half the toys for a month. After a month, put away the toys you currently have and get out the toys which were put away. You could even do this on a quarterly basis. This method can help you to see what toys your children really like and use. It also might help encourage more contentment with you already have since your children will probably feel like they are getting “new” toys quite often–when really it’s just the same old toys they’ve always had being presented in a new way! This idea has so many variations, but the basic gist is to divide most of the toys in your home into seven groups and put them in seven different tubs labeled with the days of the week. Your children can then play with the appropriate tub each day. It keeps things rotated and fresh, while creating less mess. We’ve done variations of this in our home with great success. See how Stephanie implemented this in her home. My boys started a “friend toy swap” which is their idea of giving to their friends. Anytime they have a friend over to play, they let their friend choose one toy to take home. I approve all toys before the friend leaves just in case they are trying to give something away, such as “their brothers favorite toy” or something that they just got and is still pretty new. This method is great for us! We have friends over often and it really helps with the clutter! My children are also learning that they really enjoy giving toys they don’t play with as often to their friends! Amy from Amy’s Finer Things often says this, and it’s so true. I loved the example Kendra gave of making a cardboard laptop for her daughter. It doesn’t have to cost an arm and a leg to keep a child contented, happy and busy! 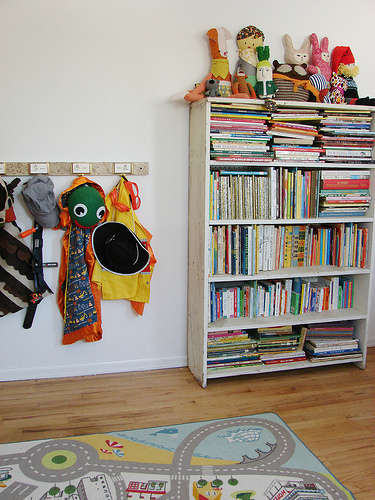 What strategies and solutions do you use in your home to keep the toys from taking over your life? Tell us in the comments. After we moved back to our hometown and Jesse started his law firm, things were a little shaky for the first few months. We’d already started a few businesses in the past, so we knew somewhat of what we were up against in opening the law firm. But in another respect, this was a completely new ballpark. We had experience in online marketing, but developing a local business — especially when there are strict rules and regulations regarding how you can market yourself as an attorney — was a huge learning curve. But Jesse was motivated, focused and driven, in spite of the many different obstacles and setbacks which came his way. And it was so wonderfully incredible to see my husband throw himself into building his business from the ground up. He spent hours researching, reading and listening to audiobooks on entrepreneurialism, marketing and starting a business. He tried many out-of-the-box ideas and slowly his business started to take off. And then, God had a big surprise waiting for us. Only a few months after Jesse started his practice, the attorney he was office-sharing with approached him about an opportunity. Another local attorney, who’d had his own practice for many years, was getting ready to close up shop and was looking for someone to take over his phone lines, phone book ads and client base. It seemed too good to be true and we were definitely interested! The only catch was that we had to be willing to take over the payments on the phone book ads. As a brand-new business owner committed to staying out debt, the costs of these phone book ads were pretty significant. Once again, we prayed about it, crunched a lot of numbers and finally decided that the costs involved with this were worth it. So Jesse accepted the offer and assumed the phone book ads and phone lines of this well-established attorney. Within a few weeks, we began to discover just how huge of a break this was for Jesse: the phones were ringing, the clients and appointments were lining up and Jesse was starting to have more work than he could handle on his own. I began helping him out for an hour or two each day from home (typing up letters, handling administrative details, etc. ), but it was quickly becoming too much for me to keep up with. It was a little daunting to consider hiring an assistant so soon after beginning the law firm, but we realized that there was no other way he was going to be able to keep up with things at the rate it was growing. So we were very thankful when he found and hired a full-time assistant soon thereafter. It’s been amazing to look back and see how God has blessed the law firm from the get-go, far beyond our wildest dreams. In fact, from the first month, it has turned a profit. We’re humbled by God’s goodness. It’s also been so thrilling to see Jesse succeeding in his work and loving what he does. Having your husband find great fulfillment in his career is wonderful to witness. I feel like God taught Jesse much through those first few years of job difficulty, all of which prepared and equipped him for his business now. In addition to God blessing Jesse’s business abundantly, God also continued to bless MoneySavingMom.com. The traffic steadily increased, and along with that, the income from the site increased. Because we didn’t have any debt and were able to keep our expenses low, the good income which was coming in from our businesses allowed us to be able to save a significant percent each month towards our house fund goal. We’d set a big, hairy, audacious goal of saving our 100% down goal by the end of 2009, but truthfully, we didn’t ever expect we’d actually hit that goal. And as fall rolled around, we were still quite a ways off from it. That was okay; we were happy with the traction we’d made and excited about the direction things were moving. But then, November and December came and our earnings ended up being much, much higher than usual because of a couple of unexpected business opportunities which arose due to the Christmas season. We were absolutely floored and thrilled to actually hit our 100% down goal by the end of 2009. We started looking for houses in earnest at the beginning of 2010 and continued saving while we did so. Five months later, we found the “perfect” house. It was much nicer than we were expecting to purchase, but the price was exactly within our budget and it had every single feature we were looking for, plus a number of other things we had always thought would be really nice to have in a house. We prayed about it, researched everything we possibly could, got a second and third opinion and felt like this was “the” house. So we put in an offer, the owners accepted our offer, and six weeks later we brought a cashier’s check into the realtor’s office, signed the contract and paid 100% down for our house. It was the most amazing feeling — and it still is. We know that there is no way we could ever be debt-free, house and all, were it not for so many factors: the wise financial foundation our parents laid for us early on; Jesse’s dad investing the money from his mom’s death so we could pay cash for law school; discovering Dave Ramsey, a man who motivated us to dream big dreams and set big goals; our commitment to stay out of debt during law school which fueled our creativity and entreprenuerialism, which then resulted in two businesses which provided good income to allow us to save. And ultimately, we give all the glory to God. For some reason, He chose to give us the parents He did, the financial upbringing He did, and to put us in the financial position He has. We don’t deserve any of it, and He could take everything we own away from us tomorrow. It’s His money and His house and we want to be wise stewards of what He has entrusted to us, for as long as He chooses to entrust us with it. I write all this not to bring glory to ourselves, but to inspire you. We’ve made many mistakes along the way. There have been many struggles. But we have seen so clearly in our own lives that making short-term sacrifices in order to accomplish long-term goals can be so rewarding. And I’ve shared the details of our story in the hopes that it will encourage you — in whatever financial situation you’re in — to set goals, stay focused, think outside the box, be creative, and reap the fruits of your efforts and diligence.